Colorado Wine Press: What's a winery's responsibility? What is a winery's responsibility? Is the responsibility to the consumers or to itself? Should a winery always strive to make the best wine possible or should it simply offer commercially viable (i.e. not flawed) wine at a fair price? Should a winemaker only make wine he or she likes or should consumer preferences be considered? Should a vineyard be planted with popular variety, such as cabernet sauvignon, because it will sell or should a lesser-known variety, like petit manseng, be grown if it is better suited for the site? I think all of the above are fair questions and could all be answered in the affirmative. What got me thinking about winery responsibility was the release of Screaming Eagle's third wine. In 1995, the very first commercial vintage (1992) from this tiny Napa winery garnered a perfect 100-pt score from critic Robert Parker. Parker's (and others') continued enthusiasm for this small-production cabernet sauvignon started a high-end wine frenzy that has gotten more outrageous every year. Now, Screaming Eagle is the most expensive American wine with a release price of $750 per bottle. Yes, that is one dollar per milliliter of fermented grape juice. Almost $30 per fluid ounce. For almost two decades and three owners Screaming Eagle produced exceptionally limited amounts of just one red wine. However, earlier this year Screaming Eagle released 50 cases of a sauvignon blanc for a relative bargain price of $250 per bottle. Both the red and white can be found on the secondary market for thousands of dollars per bottle. The release of the white Screaming Eagle came as a bit of a surprise, but just this week Screaming Eagle announced the release of a third wine produced from estate-grown merlot and cabernet franc that is not blended with the iconic cabernet sauvignon. This new wine is called Second Flight and is being initially offered as a vertical pack (two bottles each) from the 2006, 2007, 2008 and 2009 vintages for $225 per bottle. Now, I have no problem with wineries using excess juice to produce less expensive "second" wines, but this release made me scratch my head. In the September issue of Decanter magazine, Adam Lechmere described his rare visit to Screaming Eagle's vineyard and winery in Oakville. In the article, Lechmere explained that "there is no second wine: what doesn't make the blend is poured down the drain." Well, now we know this isn't true. Even more curious to me is a quote from former co-owner of Screaming Eagle, Charles Banks. 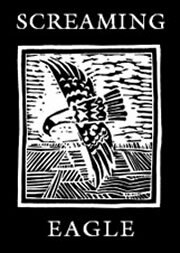 Michael Jamais, of California Wine Report, wrote about the white Screaming Eagle this past May. In the article, Banks is quoted as admitting, "merlot actually doesn't perform very well in our vineyard." This confession strikes me as troubling considering the new wine is made with merlot. Is Screaming Eagle pawning this merlot-based wine (some vintages may contain more cabernet franc) on its customers just to make a quick buck? Or are they attempting to meet an almost limitless demand on all things Screaming Eagle? I have no reason to suspect that this wine is anything less than delicious, but I also have no reason to doubt the former owner's claim that merlot doesn't do so well on Screaming Eagle's property. What is Screaming Eagle's responsibility when it comes to its wine, especially considering the price? Is Screaming Eagle's responsibility different from any other winery? What do you think? I have a hard time worrying about buyers of Screaming Eagle. This is not a wine being sold to wine aficionados. I think it is ridiculous to base the price of one wine on the price of another. Even if I had the $$ means, I would not spend $250.00 for a SB. In the end it will top out and even out. Perhaps the owners will sell out before the reputation goes. Nothing to say until I taste. And I can't afford. And they don't need me. If you are a consumer in Colorado, there is plenty of fine wine available. Cask 23 is not too shabby, nor is Dominus. Spotty wood comes to mind also. And rumor is that Bordeaux had decent weather in 09 and 10. Just a rumor. I think my responsibility, and hopefully yours, is to the consumer. In a blind tasting, can 10 or 50 consumers tell that SE is better than these others??? Also, how many wineries tell the truth about 2006 red wines from Napa & Sonoma? See them on the flash discount sites. Still. Many. Why??? Even a $500 bottle can't reverse the unkind deal of mother nature in a severe heat wave that stunts maturation at a crucial time. I hear lots of things. From winemakers occasionally, things that are bald (or fully wigged out) lies. Or stupid, ignorant. So, my responsibility is to the consumer. That goes with the territory. Harvey, thanks for the comment. Where did you hear that CS is 53-67% of the blend? From the release letter is seems that it would be a merlot/cab franc blend that varies vintage by vintage. I have no doubt that it will be a nice wine, but for $225 a bottle I think compelling is more than a prerequisite, regardless if it is only 1/3 the price of the regular SE. I understand that SE will not put out anything that gives bad press, but a Decanter article that is less than one month old that states no second wine exists and the former owner criticizing merlot in the SE vineyard contradicts that ideology. I would love to hear what you think of the wine (I would love to try it, but I can't afford it!). You can write your notes on this post or you can email me and I will make sure to get them on the site. I know that most of my readers (including me) have not experienced SE, but I still think what they do is important for all of the wine industry. Thanks for reading and commenting! Thanks for the reply and your viewpoint. I received the blend from Screaming Eagle directly. The letter was misleading, so I asked and received it in an email from them. I cannot comment on what they said, nor do I wish to defend any winery, as i just look for logical explanations and decide for myself what I think is correct. I have a nice little cellar with approx. 500 +- artisanal bottles. Very few are worth the money, with some exceptions like David Fulton Petite Sirah, Stanton Petite Sirah, and a few others. It just gives me pleasure to try a diversified hands on, quality oriented wines that are produced in small quantities, as that to me typifies what is so unique and good about US wines. The prices are crazy and not worth it, but few things in life are. It makes me feel rich to taste, and catalog the nuances within my mind. And when I say rich, I do not mean financially, as the spending on them has quite the opposite effect. It makes me appreciate what dedicated craftmenship brings, when one applies everything available to them to craft as fine a product as they possibly can. To me..That is rich, and that is memorable.... I agree that irrespective of price, US wines like SE, Abreu, Harlan, and others have in such a short period of time, amped up the wine market globally, and instilled a new level of quality into what was a stodgy, Euro centrist unidimensional world of grapes. Harvey, thanks for the update on the blend. No defense of SE is necessary. I actually do not mean to attack SE and am sure the wine is of the highest quality. Second Flight actually sounds more interesting to me than SE. I really like what you say about finding richness in wine. I feel exactly the same way. I love experiencing both cultural and physical geography in each and every bottle of wine I open. We live in an exciting time in the wine world and exploring and communicating our journeys and experiences are so important in my eyes. Thanks for sharing! Qualification: I have been selling wine from the source (wineries) for over 20 years, live in Nor Cal, and know hundreds of winery owners and winemakers and wine sales folks. Wine, in its way, is theater. The audience DOES NOT know what the wine really looks like without its makeup on. Period. Sorry. Will I kiss and tell? Deconstruct Screaming Eagle and you will not find contents more valuable in any way than, say, Shafer Hillside Select (purposely naming a wine I have never sold). I have had Screaming Eagle. I have had Hillside Select. I have sold Cain, Montelena, Duckhorn, now Corison, and more. There are practical reasons for a wine to cost what it does. Once a bottle, any bottle, bounces in to the $150+ zone the consumer will be paying for scarcity, gold-crusted winery furniture, image. You know what they say why some guys need to drive Corvettes? Ditto why some guys need to buy the most expensive bottle. I have sold a lot of Corvette owning guys a lot of pricey wine. There's always going to be someone out there making and selling a Screaming Eagle - along with its smoke and mirrors - Screaming Eagle has no more responsibility to the consumer of such goods than Tesla does. They just need to make sure it gets the customer where he wants to go without killing him. When I told Joel Peterson (my employer from 1992 - 2001) that I was going to work for the most honorable (and I mean that) Cathy Corison, he congratulated me for being hired by one of the few remaining winery owners/makers in Napa Valley with any "integrity". As David Darlington gushes; Joel is one of the great guys. To have him so laud Cathy made her deeply blush (of course I had to tell her!) It's an honor to work for truly the most minimal interventionist winemaker I have ever worked for. She prizes transparency and nice, simple methods. Oh, and she tells the truth.